"It's the economy, stupid" wasn't just a phrase used by Bill Clinton to win against George Bush in 1992. And it doesn't only apply to presidential elections. There is evidence to suggest that voters will make their choices for the House of Representatives based on how the economy is doing. 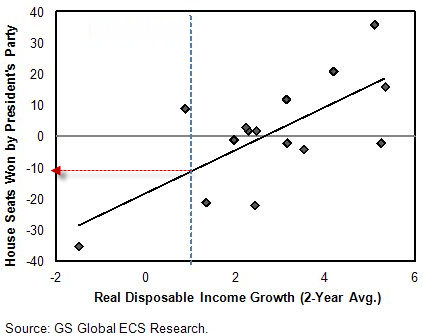 Two good predictors according to Goldman are the real disposable income growth (2-year average prior to election) and the real GDP (Q1-Q3 prior to election). Depending on how these measures perform, the president's party will win or lose some number of seats in the House. Not a surprise. The regression charts for these two indicators are shown below. 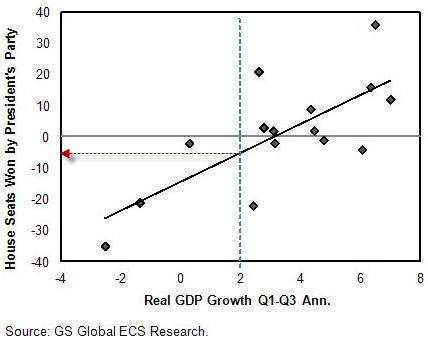 The blue vertical line is Goldman's forecast of where real disposable income growth and the real GDP will be by the time of the 2012 elections. This is telling us that based on the tepid growth in income we've had in the US and the projected annualized GDP of 2% by the end of Q3, the Democrats will lose 5-10 seats in the House of Representatives in the fall (regardless of who takes the White House).